I think everyone in my immediate family knows that I have a thing for washi tape! I love to stack it up in rainbows and make it look pretty. Recently I have acquired some new ones and I have the intention of photographing them and will hopefully be sharing an updated photo soon. (The photo above is an instagram from a couple months ago.) I love to use it with my Project Life and on scrapbook pages. But did you know that you can use it on the wall? I have been using it to tape grocery lists, meal lists and most recently our camping list onto the kitchen wall. Its super useful and also pretty. 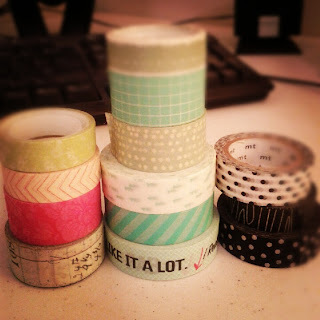 So until I become crafty enough to make my own chalkboard, this washi tape will have to do.